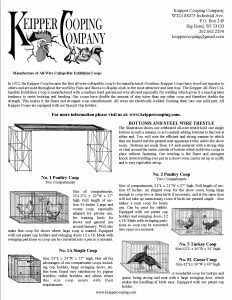 Keipper Cooping became the first all wire collapsible coop to be manufactured. FOR OVER ONE HUNDRED YEARS, Keipper’s coops have stood out superior to others and are used throughout the world by Fairs and Shows to display stock in the most attractive and neat way. The Keipper All-Wire Collapsible Exhibition Coop is manufactured with a medium hard galvanized wire alloyed especially for welding which gives it a much greater tendency to resist twisting and bending. Our coops have double the amount of stay wires than any other coop and therefore double the strength. This makes it the finest and strongest coop manufactured. All wires are electrically welded, forming them into one solid part. All Keipper Coops are equipped with our Special cupholders. We handle national and international orders from all. Order direct from the factory and solve your fair, show or any other cooping problem. 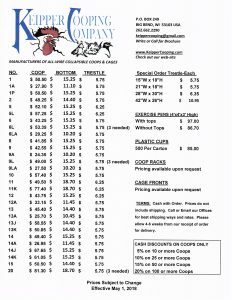 We have a detailed brochure of all of our coops and you can download it by clicking on the image below. Each coop has the exact dimensions listed. 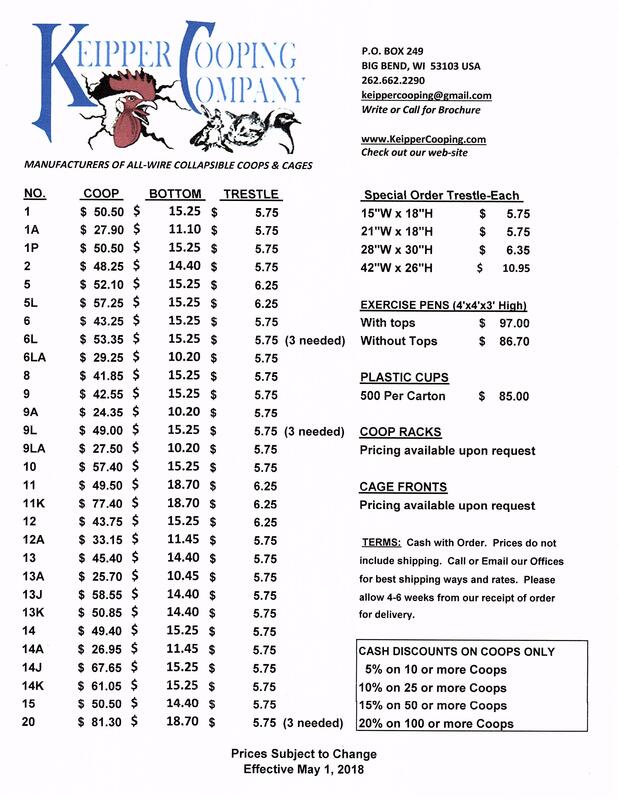 For our current pricing information, please click on the image below.